Home » Chilaw Meeting , Democracy , Live and Speak , Media Freedom , NAFSO and PFF , Plafform for Freedom » PFF breaks the silence of Chilaw…. PFF breaks the silence of Chilaw…. 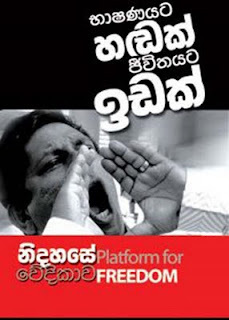 The hard silence of Chilaw was broken by Platform for Freedom (PFF) by holding its public meeting (Mahajana Sabhawa) today at “CROWN HALL” in Chilaw. National Fisheries Solidarity Movement (NAFSO) organized the programme under the theme of “Let the people live and speak” as we are a one of the committee members of the PFF. The number of speakers representing political parties, civil society, trade unions and media organizations, Mr. Britto Fernando, Mr. Loyel Peries, Hon. Mangala Samaraweera, Hon. Mano Ganesan . Mr. Ravi Jayawardana addressed gathering and some other parliamentarians were also present at the meeting besides 500 people from various villages within the region. Participants gave their service to make this a successful one and to continue this public meeting in another district or region for addressing people according to the main these of PFF. These Public meetings will be held in every district and the regions in this era without a Media freedom and the right to live. Let us keep the full stop to stop this tyrannical ruling process.